Start your prep work about two hours ahead of time. 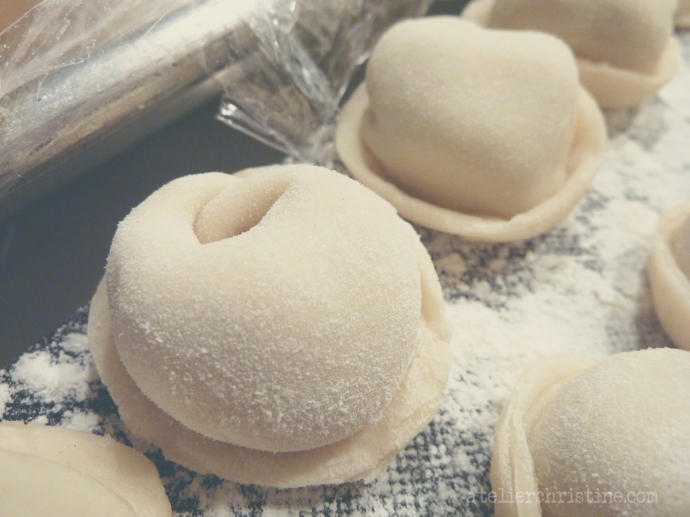 Manti dough, which is similar to pasta, is ideally made in a stand mixer, but a pair of strong hands/arms works well too. Work dough until translucent and pliable enough; keeping it medium-firm so it is easy to roll yet strong to hold its finished shape. I generally prefer to use tipo ‘00’ flour to get a stretchable dough that has a bite yet is not chewy. If not readily available for purchase in your area, use a mixture of unbleached bread flour and all-purpose flour. All-purpose flour just by itself works fine, but results in a delicate dough with less texture that might break during simmer. Antimo Caputo Tipo ‘00’ Chef’s Flour can be purchased online through Amazon. The King Arthur Flour Company has an American clone of Italian tipo ‘00’ flour, labeled as Italian-style flour, and available for purchase through their website. Meanwhile, as your dough rests for two hours, put together your filling – a mixture of minced beef, onion, parsley and spices. Roll out dough, to which is ideally 1/16”-to-1/8” thick, and cut into circles. If you have a pasta machine at home feel free to use it. To assemble Manti, place filling on cut-out rounds and fold over one end to form a crescent (semi-circle); sealing edges as you do so. Take the two ends, from the straight side, and pinch them together around your finger, then turn the bottoms up as you arrange dumpling / ‘agantch’ onto a sheet pan covered with plastic wrap and generously dusted with flour. Prepare yogurt soup as instructed in the recipe. Strained yogurt, or Labne / Lebni / Kefir Cheese, can be found at your local supermarket; sometimes labeled as Greek-Style Yogurt. Pick a brand that is not salty but somewhat tangy; you want to be able to season the soup. I use one-part mild but flavorful labne like Sadaf or ARZ mixed with half-part tangy rich labne like Byblos. Traditionally a homemade rich broth is used, but a good quality chicken base or demi-glace works well. I equally love to use either of these three alternatives: Better Than Bouillon concentrated chicken base, Williams-Sonoma chicken demi-glace or Glace de Poulet Gold classic roasted chicken stock. 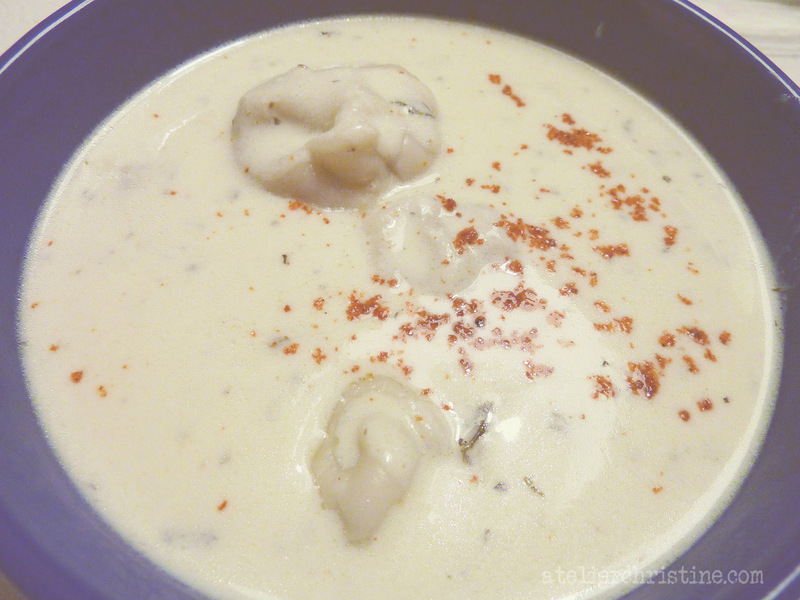 Cook dumplings in broth, or salted water, just like pasta then add to soup. You can also bake dumplings in a 350F oven for 10 minutes until slightly golden, then simmer them in the soup for 20-to-25 minutes; this makes a thicker, stew-like soup. Serve warm sprinkled with red Aleppo pepper flakes. Manti, with all its variations and shapes, is served and prepared differently depending on where your ancestors came from. 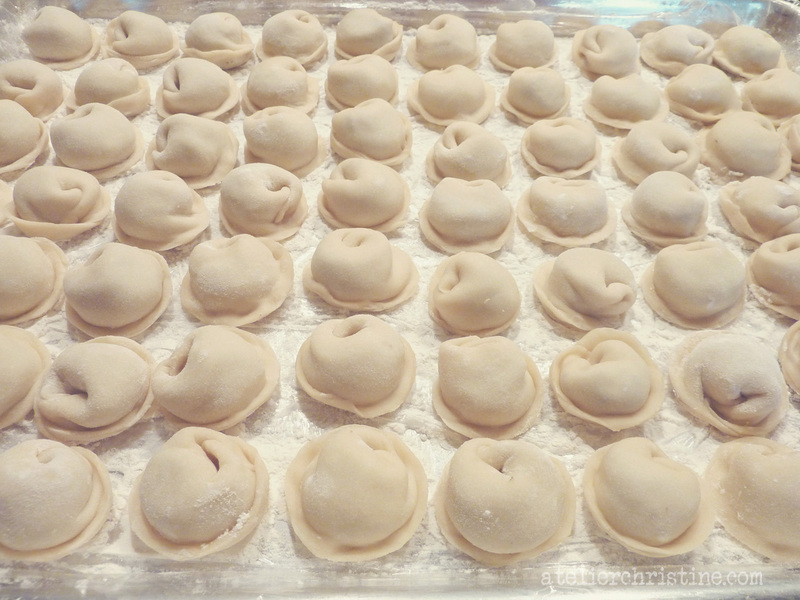 In this recipe, they are shaped like tortellini, boiled like pasta and served in yogurt soup. This is called Mantabour; better known as Angaj ‘Agantch’ Abour in the old days. Another way to prepare it is in a simple tomato broth. To make Sulu Manti (manti soup), combine browned oxtails or stew meat in a pot with some tomatoes, tomato paste, water and chickpeas that have been soaked overnight and cook until tender. In a small saucepan, sauté garlic, dried mint and oil then add to pot and simmer for about 10 minutes. Bake dumplings in a 400F oven until slightly golden and add to soup. Continue to cook for another 18-to-20 minutes; adding lemon juice towards the end. 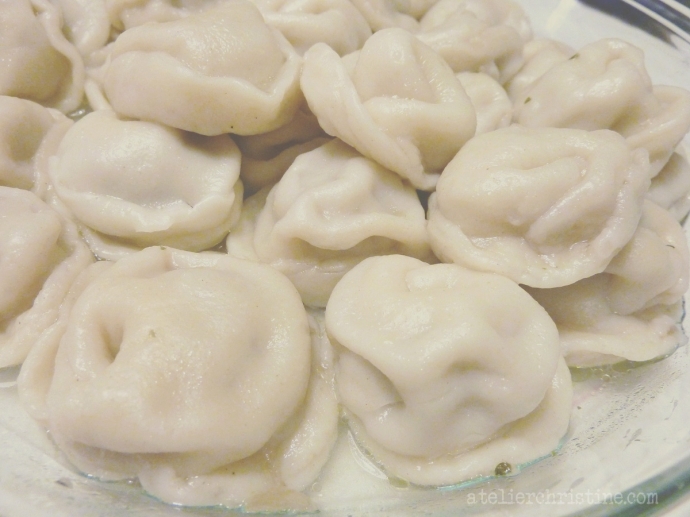 You can also serve it this way: mix yogurt with some minced garlic, season with salt and thin with a little water then spoon over cooked dumplings. Then heat some olive oil and red Aleppo pepper flakes for about a minute and drizzle over yogurt – or, sauté finely diced tomatoes and paprika in butter and drizzle over yogurt. In North-West Turkey, the steamed dumplings are topped with a mixture of crumbled hard cheese and chopped walnuts, then topped with browned butter and served with a side of pickles or dried fruit paste. Shishbarak is the Middle Eastern version of Manti. The minced beef filling is precooked and dumplings are served on a bed of white rice; topped with thick cooked yogurt, a cilantro-garlic paste and toasted pine nuts. To prepare shishbarak: simply add a dash of cinnamon while preparing filling, cook until browned and cool completely before assembling dumplings. Boil or bake dumplings for about 10-to-12 minutes. For the sauce, mix 1/4 cup water with 1 1/2 tablespoons cornstarch and whisk into about 2 cups of strained-yogurt. Cook on low heat until thickened and season with salt. Add in dumplings and simmer gently for about 10 minutes. Meanwhile, sauté garlic and cilantro in oil or butter in a pan and add to sauce. Prepare dough. Using a stand-mixer with the paddle attachment, combine flour and salt on low, setting #1, then add in oil and butter. Mix on medium-low, setting #3, until mixture resembles coarse breadcrumbs. Slowly add in egg. With the mixer still running, gradually add water until dough comes together. Once you use 2/3 cups of the water, switch to the dough hook and continue to mix on low, setting #2, as you add more water. Work dough until translucent and pliable enough, keeping it medium-firm so it is easy to roll yet strong to hold its finished shape. Cover with a damp towel and set aside for 2 hours. Prepare filling. Combine all the ingredients and set aside in the fridge. Have ready a couple of sheet pans, cover with plastic wrap and generously dust with flour. Assemble dumplings. Roll out dough, to which is ideally 1/16”-1/8” thick. 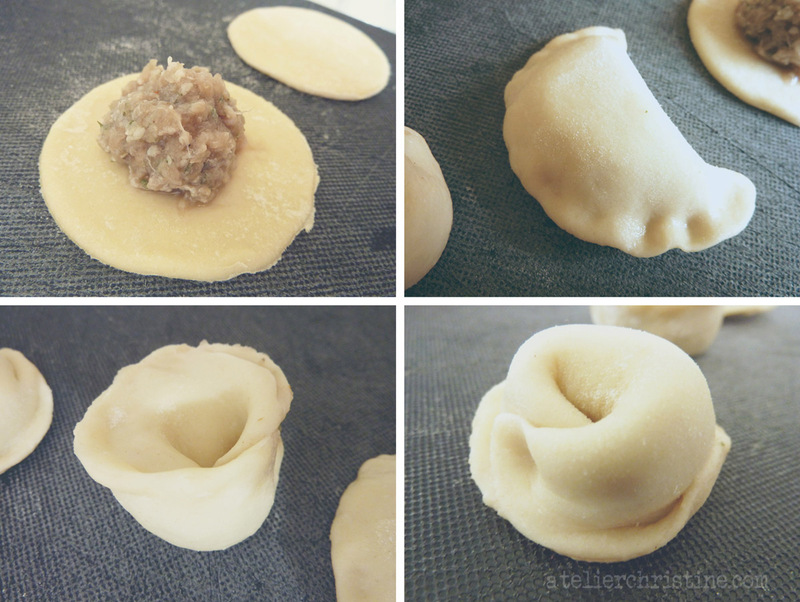 Since the dumplings in this recipe are not baked, the dough is rolled thick like egg noodles, so use #2 or #3 setting on a KitchenAid pasta roller (as a comparison, you would use setting #5 for ravioli and tortellini). 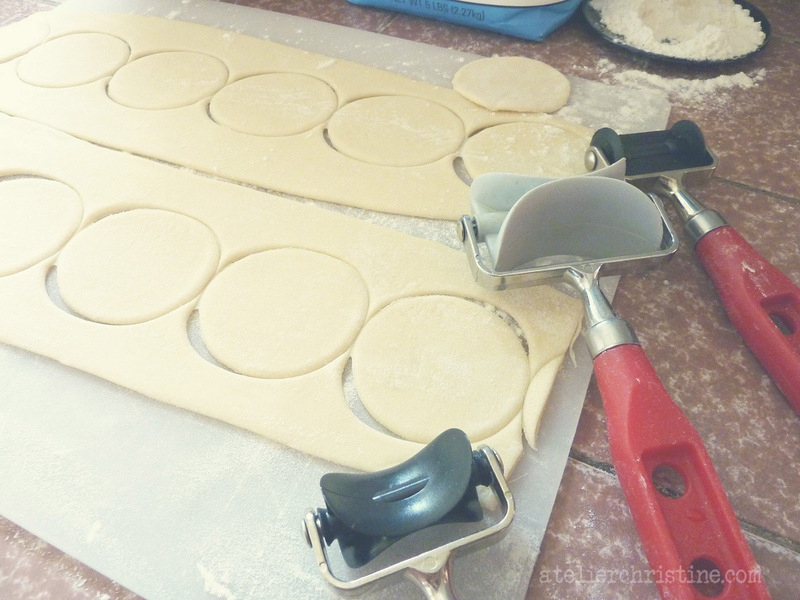 Cut circles, or squares if you do not want to re-roll dough. 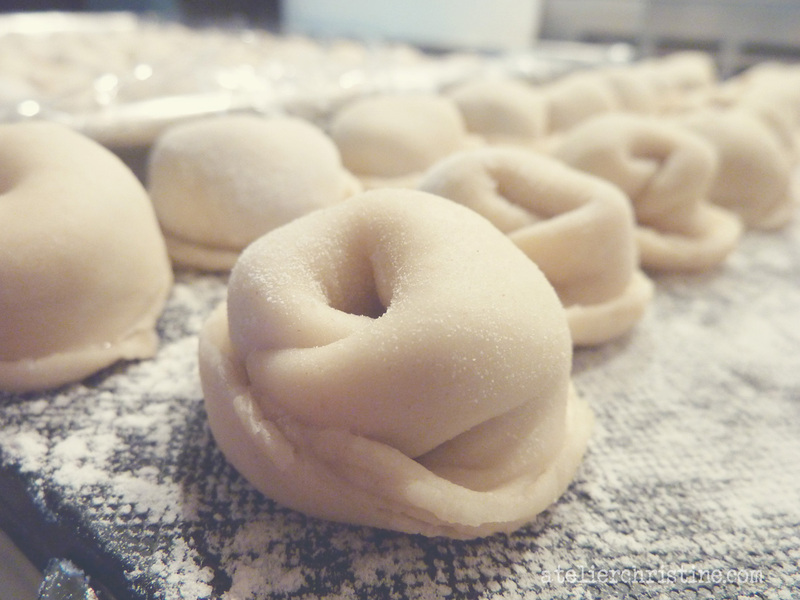 For medium dumplings, about 100, cut 2 1/4″ diameter circles. For smaller dumplings, about 200, cut 1 1/2” circles. If you decide to roll the dough thin you should have extra minced beef filling prepared. Place filling on cut-out rounds and fold over one end to form a crescent (semi-circle); sealing edges as you do so. Take the two ends, from the straight side, and pinch them together around your finger, then turn the bottoms up as you arrange them on the floured pan. Repeat. Prepare soup. Bring broth to a boil. In another heavy-bottomed nonstick pan, whisk together Labne and egg. Cook on med-low heat, whisking constantly, until it reaches room temperature, then slowly temper in the broth. Cook on low, stirring occasionally, until thoroughly heated, but do not bring to a fast boil or soup will curdle. Add in chicken and/or wheat berries or rice if using. In a small saucepan, heat oil, mint and garlic for about a minute. Add to soup and cook another 10 minutes. Cook dumplings. Add a tablespoon of oil to a large pot of broth or salted water and bring to a gentle boil. Drop dumplings a few at a time as you stir and continue to do so for about 2 minutes to prevent dough from sticking together. Lower heat to an almost simmer and cook for about 20 minutes; until done and morsels start floating to the top. Remove with a slotted spoon and add to soup. Continue to cook remaining dumplings. Alternatively, place dumplings on a greased pan and bake in a 350F oven for 10 minutes until slightly golden, then simmer them in the soup for 20-to-25 minutes; stirring for the first 5 minutes to prevent clumping. This makes a thicker, stew-like soup.